An artist's illustration of NASA's Kepler space telescope, which has discovered about 70 percent of all known exoplanets to date. The end is near for the most prolific planet hunter of all time. NASA's iconic Kepler space telescope — which has discovered 70 percent of the 3,750 exoplanets known to date — is running so low on fuel that the agency has put it into a hibernation-like state, agency officials announced today (July 6). "Until then, the spacecraft will remain stable and parked in a no-fuel-use safe mode," they added. "On Aug. 2, the team will command the spacecraft to awaken from its no-fuel-use state and maneuver the spacecraft to the correct orientation and downlink the data." The $600 million Kepler mission launched in March 2009, with the goal of helping astronomers determine just how common Earth-like planets are throughout the Milky Way galaxy. The spacecraft finds alien worlds via the "transit method," noticing the tiny brightness dips caused when orbiting planets cross a star's face from Kepler's perspective. Kepler has been tremendously successful by any measure. For example, in addition to its impressive raw planet tally (which will go up significantly; scientists are still vetting more than 2,000 planet candidates detected by Kepler), the spacecraft's observations suggest that about 20 percent of sunlike stars host a roughly Earth-size planet in the habitable zone — that just-right range of distances where liquid water could exist on a world's surface. During its primary mission, Kepler stared at about 150,000 stars simultaneously, hunting for promising transits. That work ran through May 2013, when the second of the spacecraft's four orientation-maintaining reaction wheels failed. 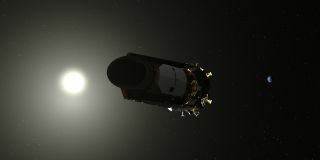 Engineers figured out a way to stabilize Kepler using sunlight pressure, however, and in 2014, the spacecraft embarked on an extended mission known as K2. Kepler continues to search for exoplanets during K2, but it's studying a variety of other celestial objects and phenomena as well. Kepler is doing this extended-mission work during roughly 80-day "campaigns," each of which has a slightly different focus. Kepler has completed 18 K2 campaigns to date. If enough fuel remains after the Aug. 2 phone call home, campaign 19 will begin on Aug. 6, NASA officials said. The fuel situation doesn't come as a big surprise; NASA announced in March that Kepler was running low and would likely have to cease operations in a matter of months. Refueling the spacecraft is not an option; Kepler orbits the sun, not Earth, and it's currently millions of miles from our planet.